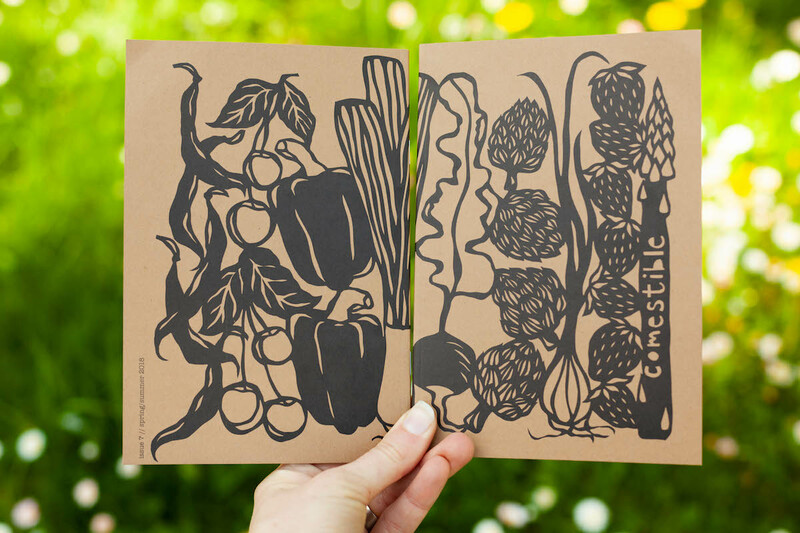 Comestible is a beautiful bi-annual zine about food. That’s what Anna Brones wants you to think about when enjoying Comestible - food. Comestible reminds us to think about where our food comes from, who grew it, and when it’s in season. It reminds us that food is political. It celebrates the way a dish can harken back to the meal times of our youth and the dishes passed down in our family. It reminds us that food can transport us to a place that may no longer exist anymore, because of war, immigration, or displacement. 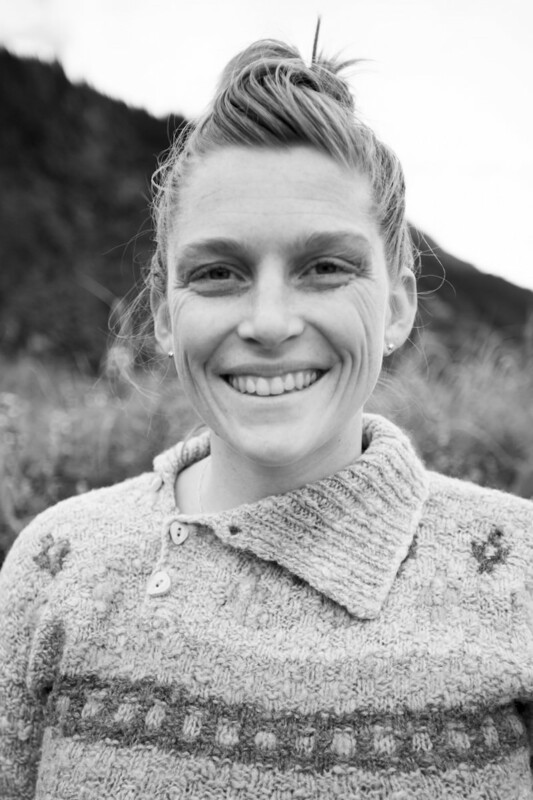 Comestible founder Anna Brones is an established writer, artist, and activist. Brones is the author of several books including Fika: The Art of the Swedish Coffee Break and Lagom: Balanced Living the Swedish Way. In addition to her writing, Brones is a papercut artist - the Comestible artwork features Brones’ beautiful papercuts, as well as illustrations by other artists. Brones is also currently working on the Women’s Wisdom Project, where she is undertaking a series of 100 papercut portraits of amazing women and their insights. A recent papercut-woman is Cheryl Strayed, complete with an accompanying podcast interview. Comestible zine photography provided by Anna Brones. What inspired you to launch Comestible? 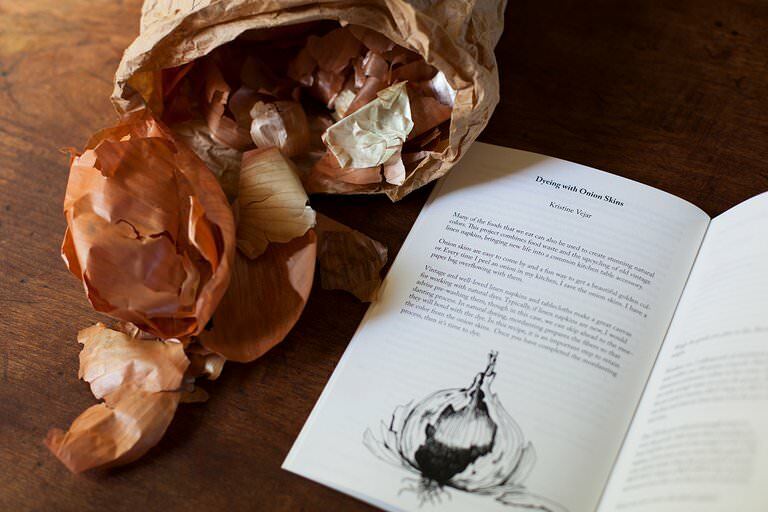 I have been food writing for quite a while, I’ve done a few cookbooks. I just got to a point where I wasn’t feeling very inspired by the food media that I was coming across - print media, I should say. A lot of the food magazines felt very similar, and very focused on the end product - and I think that’s kind of a reflection of right now: culturally we have an obsession with the visual. I think it’s easy to take beautiful photos of beautiful dishes, that we all wanna eat, but I just felt that there wasn’t more than that - and nothing was really digging very deep behind what went into food production. That, paired with the fact that I had always wanted to publish my own thing. I have worked with both a big publisher and a small publisher, so I’m definitely used to the publishing experience - but not doing it all myself. So, it was a challenge to put something out into the world, to go from concepts, to finished product. That was kind of part of it as well. With seven issues behind you now, what has the learning experience been for you during the process of publishing Comestible? There are so many aspects to publishing. I think nowadays, if you want to publish a printed publication, there are so many tools available that make it…I don’t want to say easy, that’s the wrong word. It makes it accessible. Because there’s so many programs, online tools and resources, so it’s very different from what it was even twenty years ago. For Comestible, now I have a copy editor that helps, but I basically do most of the rest myself: that means coming up with ideas, working with themes, working with writers, doing the layout, and I do the cover illustration. And I think that, for me, the most difficult part is really the publishing logistics. If you’re more well known, you can work with an independent distributor, so you would sell your publication at a bulk rate to a distributor who would then go and place that in stores, but Comestible is so small, so I do it all myself. That distribution component along with the logistics of just having lots of boxes of zines at my house, and going to the post office a lot to ship them - those are the logistical, less romantic aspects of publishing that we just don’t really see or talk about too often. Or, if we’re writers, we don’t necessarily think of those things - you just go to the store and buy a magazine, or you go to the bookstore and buy a book. You don’t think about what process happens to get it there. That’s definitely where I’ve learned the most. I also don’t have a graphic design background, I did layouts in high school, and yearbook stuff. In college, I worked on a literary journal, so I had pretty basic layout skills coming into it, but I don’t have a graphic design degree or training, so in terms of doing the layout, I try to keep things simple. It’s easier to stay with a simple and classic look - I’m not comfortable in graphic design so I would rather keep it simple and elegant, than try to get super fancy. That also fits into the overall aesthetic that I wanted for Comestible anyway. 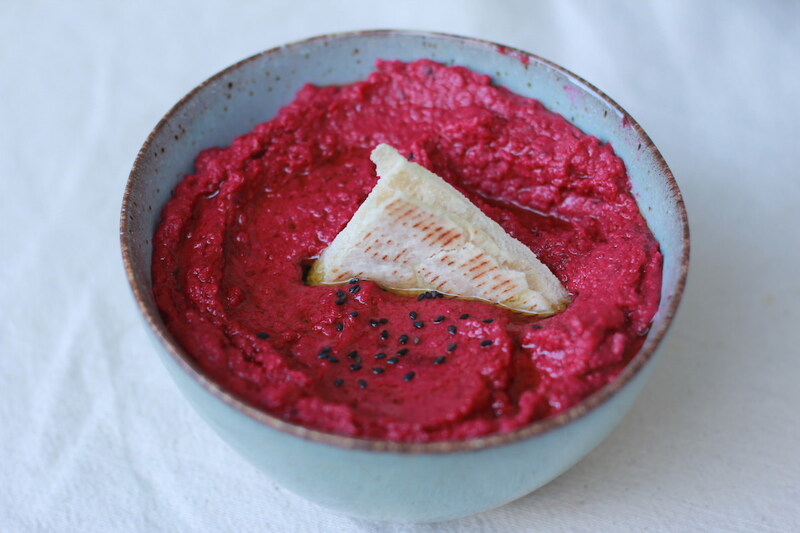 Roasted beet hummus (Winter 2017 issue). Food photography by Elizabeth Rushe. Can you tell us about the upcoming issue number eight? I thought, I don’t normally choose themes, which really just comes from me throwing this together last minute, because it’s just me! I like the serendipity, too. It was a good idea, and felt so timely, because of everything going on right now. As aware people, we are always asking ourselves, what can I do? I thought, I do have this platform, it’s not huge, it doesn’t have enormous distribution but it is a platform and I would love to use it for good. Food is such a great lens for looking at so many other issues. And I think for what we’re experiencing right now, culturally, when it comes to immigration, refugees, culture shifting - food is such a great way to tackle those things. So that was the inspiration behind doing that. We just finalised the stories that we’re gonna go with, I’m really excited, I think it’s going to be a really powerful issue. What kind of stories will you be featuring in the new issue? We’ll be taking a look at the agricultural history of California, how it was, and still is supported by immigrant labor and communities. We’ll be asking how mass media impacts our understanding of food. And we have a first generation Asian-American writer who takes a look at the representation of Asians in food media, and how the short Pixar film “Bao” is a small step in the right direction. And we have a story about breaking bread in a Yezidi refugee camp, that power of what food does for keeping culture and keeping community within the refugee community. There’ll be a story by a Filipino American writer, that looks at traditional Filipino foods, and how in the US we’ve demonised those foods, and they’re seen as either/or - Filipino foods are often referred to as unhealthy food, feeding the perception that all Filipinos are unhealthy, so we want to just break down those stereotypes, and take a look at why that is, and what traditional Filipino food is. Recipe originally published in Comestible (Winter 2017 issue), republished with permission from Claudia F. Savage. Based on a recipe from her grandmother, Florence Saleeby. Note: the dough batch and each filling batch makes enough for 40 pies. Make the dough: Combine flour and salt in a large bowl. In a medium-sized bowl dissolve yeast and sugar into 1/4 cup (60 millliters) of lukewarm water. Let sit for five minutes until beginning to foam. Stir lukewarm milk into yeast mixture and add to flour mixture. Mix well in only one direction with wooden spoon and turn onto well floured counter or board. Knead for 8 to 10 minutes, until dough is elastic and smooth. Place in greased bowl and cover with dry towel or plastic wrap. Set dough in warm spot until it has doubled. Punch down and form into a ball. Let rest 10 minutes covered with towel. 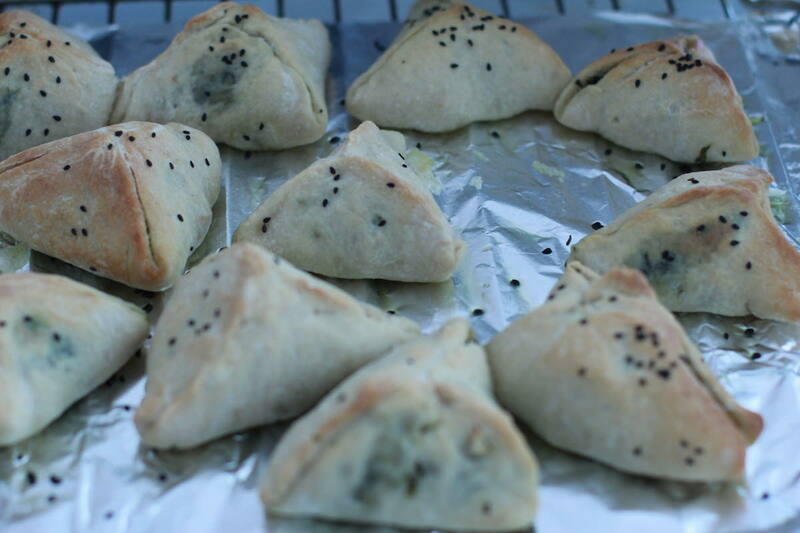 Divide dough (using knife or dough cutter) into 30 or 40 pieces. Coat hands with olive oil and form each piece into a ball. Cover dough balls with dry towel and let rise another 30 minutes. 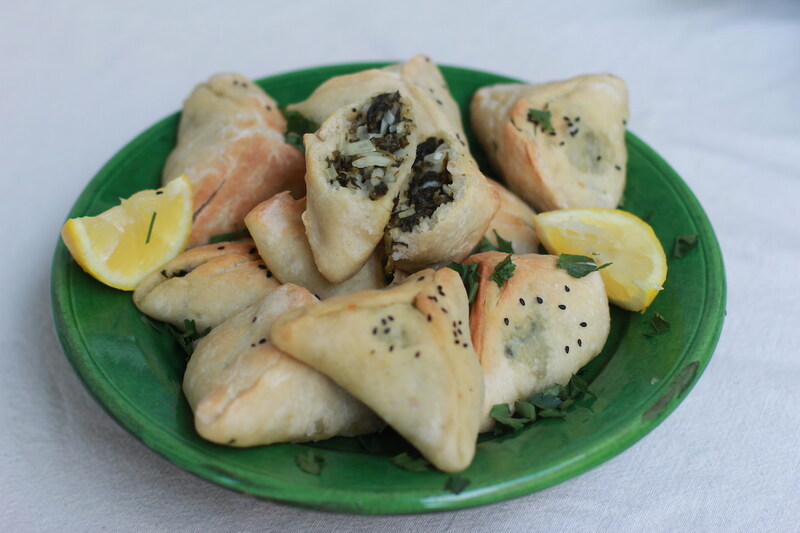 Fatayer bi sabanekh filling: Make sure the spinach is well dried or squeezed of most water. Place spinach and onion, salt, and pepper in a large bowl. Mix well and let sit a few minutes. Add lemon juice and oil. Taste. It should taste like a delicious salad. Adjust salt and lemon as needed. Fill and bake the pies: Gently flatten each dough ball with a rolling pin or your fingers into 4-inch (10-centimeter) circles about 1/8 inch (about 3 millimeters) thick. Begin filling each circle with the spinach mixture while allowing others to rest covered with a tea towel. Put a small mound of filling into the center of each circle, leaving an inch or so of space around the filling. To make the triangular pie, draw two sides of dough to the center and pinch shut a seam from the center to the corner. Draw up the remaining flap of dough and pinch shut the two remaining seams, leaving a small opening to vent the pie in the center. Brush with olive oil and place on oiled baking sheet. Bake at 375ºF (180ºC) for 15 minutes, until lightly brown on top and bottom. Don’t worry if some of the seams open when you first try the recipe. They will still be delicious. 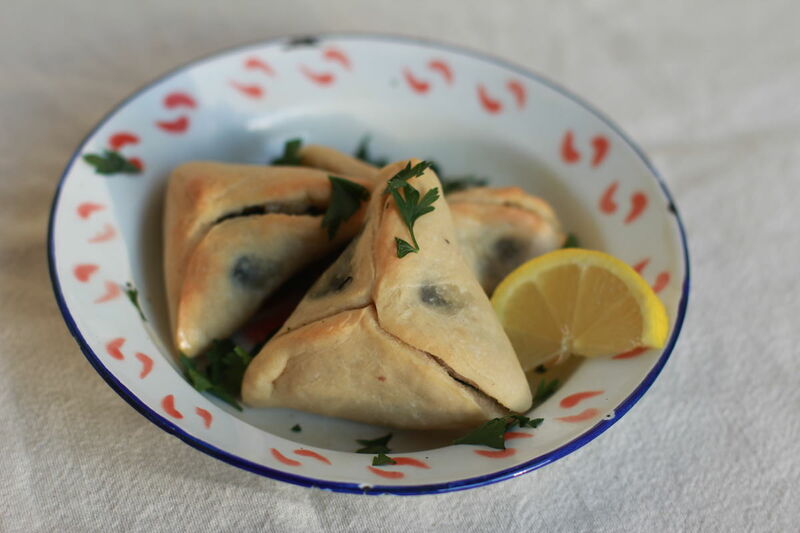 Serve warm with lemon wedges and well-drained plain yogurt. You seem to be pretty savvy at Kickstarter after running two campaigns that both exceeded their goals - is that something which is built into Comestible’s longevity? I had done several Kickstarters before, but never run one of my own, but I knew what I needed to do. That was a good way to get production funds to get it up and running. I don’t crowdfund now because I try to make all the production funds from subscriptions, like when people order two issues at a time, which allows for printing costs. Crowdfunding campaigns are great but they’re also really intensive. I was really thankful to do the first two, but if I can do avoid doing them…They just take so much time and energy, you don’t want to have to do that every single time. I already put a lot of time and energy into Comestible. I was just feeling that the media world was saturated - just in the last four years, there’s so many new, independent, food publications, so it’s really nice see that market expand. And I think that there definitely is an interest in more niche small print publications, which I think is awesome. So I think that, the indie publishing projects, there are a lot that do well. For one, I think people like to have something that’s analog, even though we use all these digital tools and platforms, I think that people like having this printed thing that they can connect with, that’s probably part of it as well. It sounds like you’re ready to do a TED Talk on zine culture! I wouldn’t for a second pretend to be an expert on zine culture, that’s what’s so cool about zines, it has such a political, punk, history to it. The tradition of zines, that if you have something to say, you have a method to do so. Comestible is quite well produced, it’s printed at a print company, but what I really want to do is a couple of one-offs, just really small, single-topic zines that are just that traditional style of zine with just one piece of paper, folded really small. I want to do some that I print at home, and maybe draw some graphics, cos I love that idea that they’re traditionally inexpensive to produce, but a way to get your ideas out into the world and that’s certainly important these days. A personal project I’ve been working on this year called Women’s Wisdom Project, and the idea for that was that I like having long term projects to work on, which comes from writing. It’s nice to continually work on something, I think particularly in the digital age. If you write an article for online, after fourty eight hours, it’s kind of done! It’s kind of depressing, but I just wanted to showcase the voices of women. As it’s evolved I’ve started interviewing more women - I have a bunch of interviews I need to transcribe. I have one coming out next week, it’ll be a podcast interview that I’m doing with a friend of mine who runs a podcast called She Explores. So it’s kind of taking different angles, but the basic element of it is the papercut portrait, paired with a quote from that woman. When I post it on my website I will usually write a short essay on that woman, who she is or was and what she’s about - both historical and modern figures. 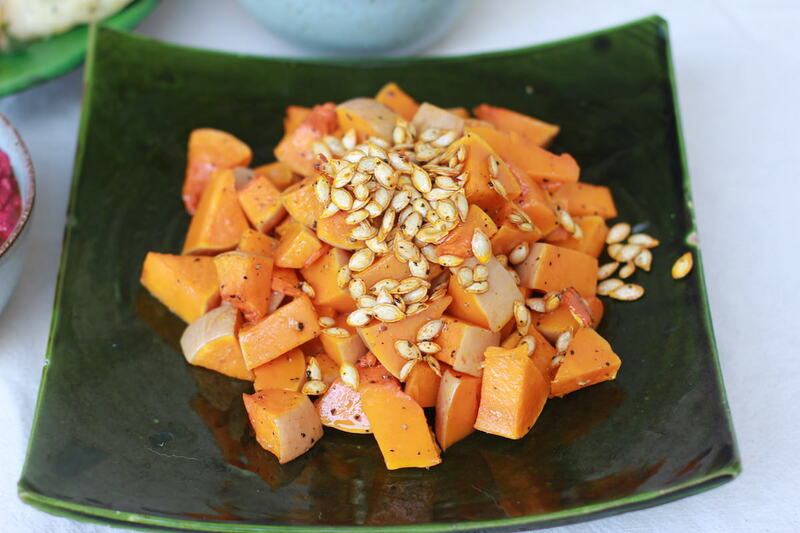 Roast butternut squash and sage (Autumn 2016 issue). 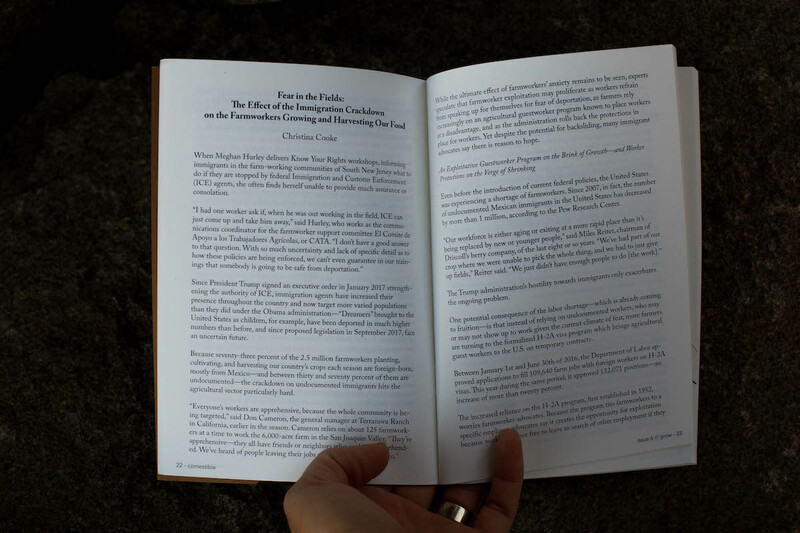 What are the challenges of running a print publication today? It’s interesting running a print publication - look at any magazine nowadays, they have such huge online presences, they have to because that’s just how you play the game. Comestible is really small, it’s really a labor of love, and very small scale. I wanted to focus my effort on the print-publishing side, I didn’t want to have an extensive website with weekly content. I didn’t need yet another platform for that. But the one thing I have started doing - just because it does only come out twice a year and it is nice to engage people on a regular basis - I send out a weekly newsletter on Fridays. The last few weeks it’s been sparse because I was busy doing summer stuff, and so are other people. Nobody wants to sit in front of their computer and read! But it’s a space where I can feature Q&A’s with interesting people in the food world doing stuff, or feature a recipe. Then there’s always a list of reading links, so it’s stuff from around the web that’s food-related in one way, shape or form, that I’ve read over the week. Just to keep people engaged. Any person selling anything online will tell you that you have to engage your community and customers. I like to think of Comestible as a source of information, providing people with interesting tidbits of information is a way to do that. Issue 8 of Comestible will be out in November 2018. You’ll be able to pick up a copy from their Big Cartel shop.